"Good, well-levelled, fair, but difficult (for everyone)." As is the custom the bingo style was used with 8 pictures scattered across the paper to liven things up. They chose 'the mother of all quizzes' as the theme - no doubt thinking of the upcoming sortie against a Mr S. Hussein of Baghdad which, indeed, may kick off on Mothering Sunday. It was a fine assortment of questions ranging from the 'fascinating facts' variety (e.g. the origin of the phrase 'back to square one' - Round 5 Question 2) through the downright obscure (e.g. Estonia's President - Round 7 Question 7) to the 'what on earth are they on about' category (e.g. the 3 guitarists in Round 5 Question 6). Along the way were some stunning pictures which win my prize as best piccies to date. "An excellent botanical round (Round 7) with real specimens carefully pinned to cards - I fear the front gardens of Chorlton have taken a hammering on our behalf." 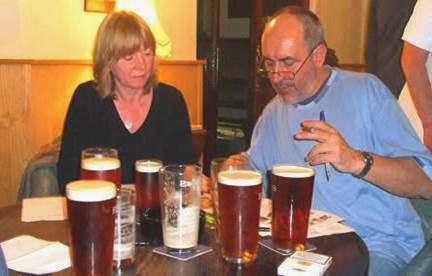 "Another really good SWMCC crossword round (Round 4)."